Enjoy hassle-free transportation into the desert on this guided tour to Los Flamencos National Reserve from San Pedro de Atacama. Get picked up from from your hotel and travel in a small group of no more than 15 to the geological rock formations of Piedras Rojas; to the Miscanti and Miñiques lagoons, and to Chaxa Lagoon to see both Andean and James flamingos. Lunch is included. Despite expecting to be on an English speaking tour, the majority of our fellow guests were Spanish. The poor guide had to give out the information twice and the result was it was all a bit rushed. However our guide was excellent and gave us a lot of information about things which interested us, when we spoke with him alone. The stop at the village should have been later when all of the stalls were set up. Last thing? Fantastic value hand knitted goods. The flamingos were wonderful and the lagoons a breath-taking sight without too many tourists. The silence was phenomenal and you could hear the flamingos lapping at the water. Lunch was not worth the stop. The soup was like drinking vegetable water, the poor non veggies had to endure a piece of chicken, a mound of rice and a few tomatoes and slices of cucumber. Come on, with tomatoes and chicken or local vegetable they were harvesting beans and sweet corn plus the interesting array of herbs, you can rustle up a decent sauce. Desert? It looked like school blancmange. Why bother? The local fruit is fabulous. It was a long and at times hair raising drive at speed because of the distances covered and if you're prone to altitude sickness, it will get you at the lagoons. The scenery was amazing though. My suggestions? Take more time, make it a longer day at a slower pace, end with the market. Lunch? Forget the soup, make a decent tomato based stew with either veg or chicken on a bed of rice followed by fresh fruit. And double the pay of the brilliant guide and driver! 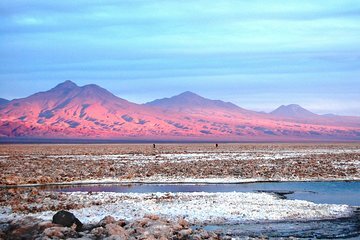 Não pude ir a Piedras Rojas, pois estava fechado, mas as lagoas Altiplanicas são de tirar o fôlego, não tem como ir ao Atacama e deixar de fazer esse passeio, certamente foi o melhor. Minha única reclamação é que ficamos muito pouco tempo nas lagoas apesar do tempo que demoramos pra chegar até lá.